Delivery drones or shipping drones are designed with various advantages such as high payloads, increased range, and high quality sensors for providing specific services such as transportation services of goods. For instance, these drones are extensively used to transfer and supply goods at rural and remote areas where other vehicles finds difficulty to cover the route. China, is one of those countries whose over 590 million of population were living in remote areas in 2017, according to the Statistics Bureau. High adoption of drone technologies for quick service restaurants and in the e-commerce sector is boosting growth of the market. According to Coherent Market Insights’ analysis, China is expected to be the fastest growing country in the Asia Pacific delivery drones market during the forecast period. Global delivery drones market is expected to witness significant growth during the forecast period (2018–2026). The market growth is majorly attributed to increasing adoption of drones in different applications in transport and logistics sector. Furthermore, as per Coherent Market Insights, growth of the market of delivery drones is also propelled by the drone industry growth, which was pegged at 2.2 million units in 2016and is expected to witness high growth during the forecast period. North America is expected to be the largest and fastest growing market for delivery drones during the forecast period, owing to increasing adoption of drones for numerous transportation and logistics applications. As per Coherent Market Insights, in 2015, the drone industry witnessed a steep growth due to new regulations from agencies such as Federal Aviation Administration (FAA), which granted new exemptions for companies to operate drones in the U.S. This is another factor expected to aid in growth of the market. Moreover, a number of e-commerce companies are trying to avail contract from governments of different countries for taking permission for the usage of drones for product delivery to customers. Also increasing adoption of delivery drones by quick service restaurants are propelling growth of the delivery drones market. For instance, in December 2018, Zomato, an India-based restaurant search and discovery service company, acquired TechEagle Innovations Pvt Ltd. for providing drone-based food delivery in India. This is expected to create a market for delivery drones in India in the near future. However, there are still some regulations in India that limits the usage of drones for food and goods delivery. Right now, the use of drones in India is limited to the applications such as photography and recreational. In 2016, Zipline (a San-Francisco based start-up) developed and launched delivery drones in Africa, ‘Sky Ambulances’, which is used for dropping-off lifesaving blood supplies through parachutes to remote hospitals and clinics that are located outside the Rwandan capital of Kigali. Introduction of hybrid drone is expected to fuel growth of the delivery drones market. There are three types of drones, which are used for transportation and logistics of goods and food items- fixed wing drones, rotary blade drones, and hybrid drones. 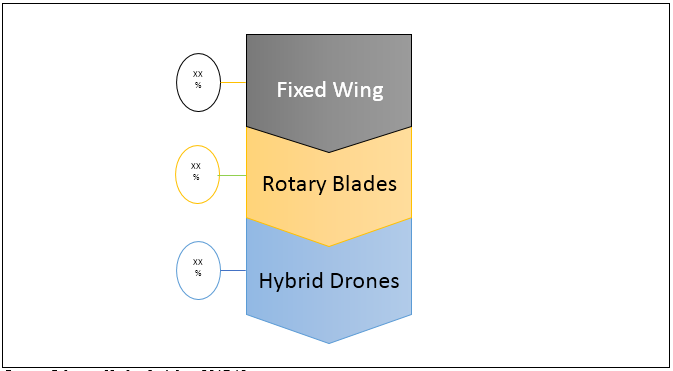 Rotary blade delivery drones dominates the market owing to its ease of use and capabilities such as vertical take-off and landing (VTOL) and its increasing adoption by new users of delivery drones for last mile products and food delivery services. According to Coherent Market Insights’ analysis, hybrid drones are expected to be the fastest growing drone type during the forecast period, owing to increasing adoption of hybrid drones due to its advanced capabilities such as longer flight time, higher payload capacity, and increased range up to 4-5 times of the normal delivery drones, which have a range of around 10-20 miles. Some of the key players operating in the global delivery drones market include The Boeing Company, Airbus SE, CyPhy Works, JD.com, SKYCART Inc., Drone America, Matternet, SZ DJI Technology Co. Ltd., and others. Delivery drones have witnessed significant adoption in the transport & logistics applications during the forecast period, owing to increasing development in drones industry for introduction of high payload drones for sectors such as logistics and goods delivery. However, complex terrain and limited range of delivery drones are some major factors expected to restrain growth of the market during the forecast period. Requirements of proper knowledge and high expertise for maneuvering delivery drones are another factors hampering growth of the delivery drones market. 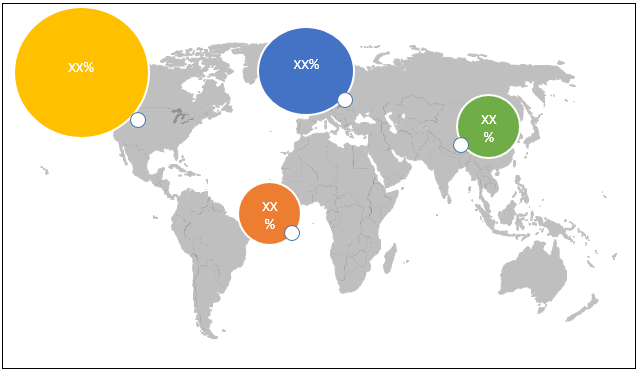 The global delivery drones market growth is attributed to rise in demand of delivery drones in e-commerce, healthcare sector, and quick service restaurants for transportation and logistics of goods are some of the major factors driving growth of the delivery drones market. For instance, goods delivery companies such as Amazon, Google, and UPS are experimenting in Unmanned Aerial Vehicles (UAVs) for delivery of goods in different areas. In addition to this, in 2017, Airbus released Skyways drone delivery services in Singapore. Furthermore, e-commerce industry players are focusing in the development of drones for transportation and delivery of goods. For instance, in 2016, Amazon signed a contract with the UK government for testing of drones for goods delivery. In December 2016, Amazon delivered its first product in the UK through autonomous drones. According to the company the product was delivered to the customer after 13 minutes of order. Such factors are expected to boost growth of the delivery drone market in the near future. However, logistical challenges and stringent regulations of Federal Aviation Administration (FAA) for usage of drones at different regions are restricting the usage of delivery drones for logistics and transportation enterprises. Stakeholders would have ease in decision-making through various strategy matrices used in analyzing the global delivery drones market. SZ DJI Technology Co. Ltd.
*Browse 60 market data tables and 40 figures on "Delivery Drones Market - Global forecast to 2026”.